The new Economy and Energy Minister of Bulgaria, Traycho Traykov, has issued a warning to Moscow that if Russia intends to build a new cross-Turkey crude oil pipeline, running from Samsun on the Black Sea, to Ceyhan, on the Aegean, that will mean the cancellation of the long planned Burgas-Alexandroupolis pipeline, crossing Bulgaria and Greece. The Turkish option has been five years in planning; is 550 kilometres long; $2 billion in estimated cost; and will receive and deliver 1.5 million barrels per day. The Bulgarian-Greek alternative has been 15 years in planning; 279 kms long; €1 billion in cost; with throughput of 670,000 barrels per day. The state-owned Russian oil company Rosneft and the state pipeline company Transneft have been committed to the second pipeline — until Russia’s Deputy Prime Minister Igor Sechin, who is also chairman of Rosneft, announced on October 19 that he favours the Turkish plan. Traykov, who took office after the Bulgarian elections in July, met with Russian Energy Minister, Sergey Shmatko, on October 22. Only today a source at their meeting revealed to Fairplay that Traykov made clear that tilting the balance of the Black Sea oil trade in Turkey’s favour is a strategic and commercial shift that will prove highly controversial when Prime Ministers Vladimir Putin and Boyko Borissov meet in Sofia in early December. 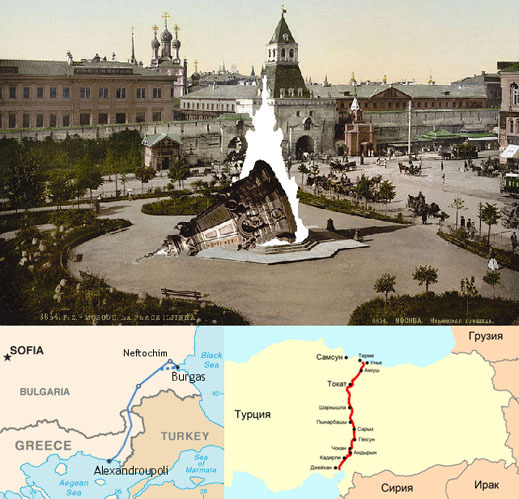 Note: the illustration refers to the Plevna Memorial in the centre of Moscow, which commemorates the siege and battle for Plevna in 1877, which ended with the capitulation of the Turks, and the subsequent withdrawal of the Turkish occupiers of Bulgaria and Romania. The memorial honours the Russian troops who lost their lives at Plevna.